Essaouira is many tourists’ darling! Previously known as Mogador to the Portuguese inhabitants, it is a charming small town on the coast well known for local handicrafts, especially thuya wood furniture, carving and small artefacts, sold in innumerable shops along the winding streets. Orson Wells filmed “Othello” here, making especially the Portuguese ramparts famous in its opening scene. Visit the women’s cooperative where argan nuts are processed by hand into one of the most versatile oils; delicious in salads and a treat for the skin. At the sea front, the customer chooses a selection of freshly caught fish to have prepared on the spot. The surfing opportunities and the beach make it an ideal spot for coastal lovers. 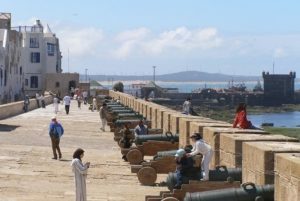 Essaouira has a favourable micro-climate; mild in winter and cool in summer. A truly favourite place to chill after a trip to the desert – on the beach, in the little cafés by the port or wandering in and out of all the little shops. The price is depends on number of people, for the price please contact us. Vehicle with driver / guide. Fuel, tolls and any associated expenses. Private tour, there will be no more people in the group. Pick up from your hotel, Riad, airport or wherever you want.